You have cleaned your aluminum siding on your home and it still doesn't have the luster you desire, painting may be in order. Maybe you have some peeling that you would like to repair. As a home inspector, I occasionally come across aluminum siding that is worn from vegetation rubbing against it or peeling due to the elements. 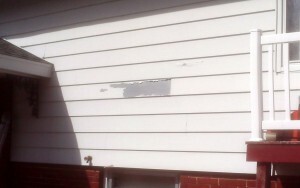 If painting is the next step, and you have cleaned the siding, your next step is to priming the effected areas. Use a solvent based primer for any bare spots or corroded areas on the aluminum. Perform a careful inspection of all surfaces of your homes siding and apply primer as required. Severely chalky areas should also be primed. After priming, you are ready for your color top coat. Choose a product that is specifically designed for aluminum and metal siding. Typically this is a 100% acrylic paint. Choosing the right product will result in a surface that will last for 10 years or more on most metal sidings. If you're the siding on your home is in real bad shape and has a lot of paint peeling, you may want to contact the manufacturer of the siding. It can be difficult to determine the manufacturer but if you know who the home builder was, or who installed the siding, they may be able to help. Most all manufacturers will stand behind their products.